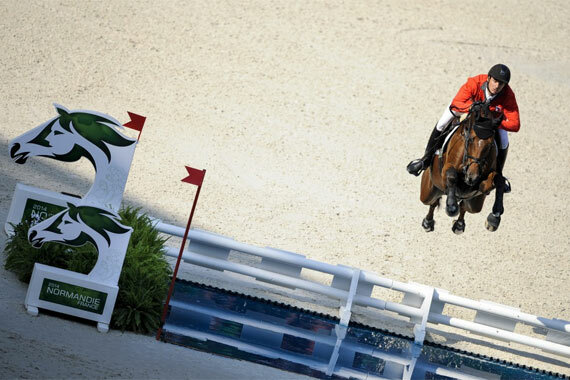 The Netherlands just pipped the home side for team jumping gold at the Alltech FEI World Equestrian Games in Normandy on Thursday afternoon. The margin between them was just 1.25 penalties, and the in-form French team earned deafening cheers from a vocal audience. Germany nearly made it onto the podium, just 0.10 of a penalty separating them from the quartet from the United States. Things didn’t go all the Dutch team’s way, however. Three of their team had four-fault rounds, with only their third in the ring, Jan Vrieling and VDL Baubalu, banking a clear, even if the horse did rub his way round to the finish. Their first man into the arena, Jeroen Dubbeldam with Zenith SFN, made his first mistake of the entire contest at the orange oxer in the middle of the influential treble (7b), as did anchorman Gerco Schroder and Glock’s London NOP. McLain Ward and Rothchild got the bronze-winning US team off to an expensive start when they were victims of Land Rover oxer ‘bogey’ at 2. Bengtsson is in second on the individual leaderboard, just behind Beezie Madden with Cortes C and just in front of Dane Soren Pedersen (Tailormade Esperanza De Rebel), whose team has not made it through to this stage of the competition. Seventeen individuals jumped in the d’Ornano Stadium before the team action commenced over the same course. Ireland’s quartet of Darragh Kenny, Bertram Allen, Denis Lynch and Cameron Hanley moved up one place from their overnight position, but because Olympic host nation Brazil were ahead in the table, Ireland needed at least a sixth place to ensure qualification. Nevertheless the top ten finish at Normandy was one of Ireland’s strongest performances this year, with just a single fence denying them a qualification place. Though missing out on team medals, Denis Lynch (19th), Bertram Allen (20th) and Darragh Kenny (24th) all now qualify for the first round of the Individual Finals on Saturday at Caen. Irish team manager Robert Splaine said: “We were one of the better teams here today and to finish one place out of the Olympic qualification zone was very disappointing. I’m gutted for the lads, as their effort was tremendous. Our year was planned around the world championships and sacrifices were made so that the best possible effort could be made at these championships. We fielded the best possible team which, but for a little hard luck yesterday, could have been challenging for a medal. Ireland’s next opportunity to book a ticket to Rio will come at the European Jumping Championships at Aachen, Germany in 2015.